Our firm has roots dating back over 50 years. Initially it was a general practice firm, but since 1975 we have evolved into a law firm specializing in civil litigation. The primary focus of the firm is personal injury law, as well as workers compensation litigation on behalf of injured workers. We also represent a number of banks and specialize in commercial litigation. Both attorneys have been selected by a survey of their peers to appear in Consumer Guidebooks of Law and Leading Attorneys-Mr. Breen in personal injury and commercial litigation, and Mr. Person in worker's compensation and real estate. 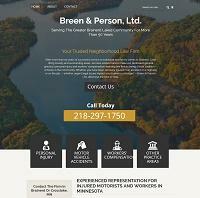 Mr. Breen was selected in 1998-2005 as a "Super Lawyer" by Mpls.-St. Paul Magazine. United Fire and Casualty Co.